OK, I’ll admit that I get a bit annoyed at that phrase “attitude of gratitude” because it can sound too cutesy and trite. But I’ve been thinking about joy and happiness (not necessarily the same, but there is some overlap) and I’ve been pondering how huge a role gratitude plays. My mother has, at least during my lifetime, faithfully lived out the verse, “In everything, give thanks.” We were talking about this recently, and she admitted that this isn’t always easy, especially in the midst of tragedy. She has pointed out that we are not asked to give thanks for everything, but in every situation. To be honest, my attempts at that have sometimes been truly pitiful. “Uh, thanks God, that You promise to never leave us…although I’m finding it hard to believe You haven’t completely deserted me for some time now!” I’m learning that, since God knows what I’m thinking anyway, I might as well give words to my doubts and fears instead of trying to pretend them away, deny them, or minimize them. God wants a relationship with us, and not that we jump through hoops to approach Him, or resort to semi-fake formulaic prayers that we aren’t really feeling or even believing. Which brings me back to gratitude: I’m beginning to believe that it’s far more for our sakes than His. God is…well, He’s God. He doesn’t need our affirmations or emotional support, because He is perfect and complete in Himself. He doesn’t suffer from insecurities, or feelings of resentment because we don’t appreciate Him enough. He doesn’t need us to help motivate Him, or to fill up His “love tank”. He doesn’t have our human frailties. We, however, can get caught up in circumstances that seem far to huge for us, far too daunting, far too catastrophic. Come to think of it, some of those circumstances are exactly that — far too terrible. But, when we can catch our breath, when we begin to realize that we may survive after all, gratitude reminds us that all of life is not forever and always one nightmarish ordeal. When God asks us to remember “the former miracles”, it’s not because He has a need to be thanked over and over again — it’s because we have a need to remember that our entire existence has not always been this crushing defeat. Gratitude gives us perspective, and it gives us hope. Sometimes, we need someone to “do hope” for us. What we don’t need is Job’s comforters from the Bible. And we don’t need someone urging us to put on a happy face, or telling us, “Buck up, kiddo!” If someone wants to help me when I’m despairing, first they need to be willing to sit and weep with me. The Bible doesn’t say, “Rejoice at those who weep” because God wants us to be truly compassionate with each other, and not just platitude-mouthing cheerer-uppers. Maybe we don’t need someone so much to “do hope” as to “be hope”. Gratitude remembers what is good. It can be like a beacon drawing us out of darkness and despair. But life isn’t all trauma and tragedy. There’s the mundane, daily grind. Gratitude gives us perspective there also, helping keep us from getting worn down and discouraged, by keeping us from focusing entirely on the negative. There was a time during the early years of marriage that I was feeling especially defeated and exhausted. I wondered if there was something wrong with our marriage, or if this was just the way life was. No matter how hard I tried, I felt like a failure as a wife, and I felt lonely and unappreciated. I began resenting my husband for what I saw as a growing list of his shortcomings, failures, and unreasonable expectations. One day, something dramatically changed: for some reason, I decided to write out a list of all the many things I appreciated and admired about my husband. Suddenly I remembered the guy had all sorts of good traits after all! My spirits lifted. Yes, I was still physically exhausted, and life was still life. But my feelings towards my husband underwent a complete turnaround. Once I reminded myself that his positive traits far, far outweighed the negative, my perspective greatly improved. There are people for whom nothing ever seems good enough. They will go to a beautiful concert and complain about one wrong note only they could hear. They will notice the minutiae out of place in an otherwise immaculate room. They will comment on your failures, but not your successes. Wherever they go, they seem to feel a need to point out flaws and mistakes — as if drawn to what is negative. Even if you force them to admit that a situation is mostly positive, it’s hard to shake the feeling that, for them, that one flaw kinda ruined the whole thing. I’ll find myself saying, “Wow, that was really enjoyable!” only to be asked, “But didn’t you notice…?” It can sound like a rebuke. Perhaps my standards are too low, or I would not find such pleasure in that which is of inferior quality. Or maybe I have decided to be grateful even when things are not perfect. I will never have the perfect life, the perfect husband, the perfect house, the perfect anything — but is that a reason not to thank God for His abundant blessings in my life? Is that a reason to rob myself of enjoyment? 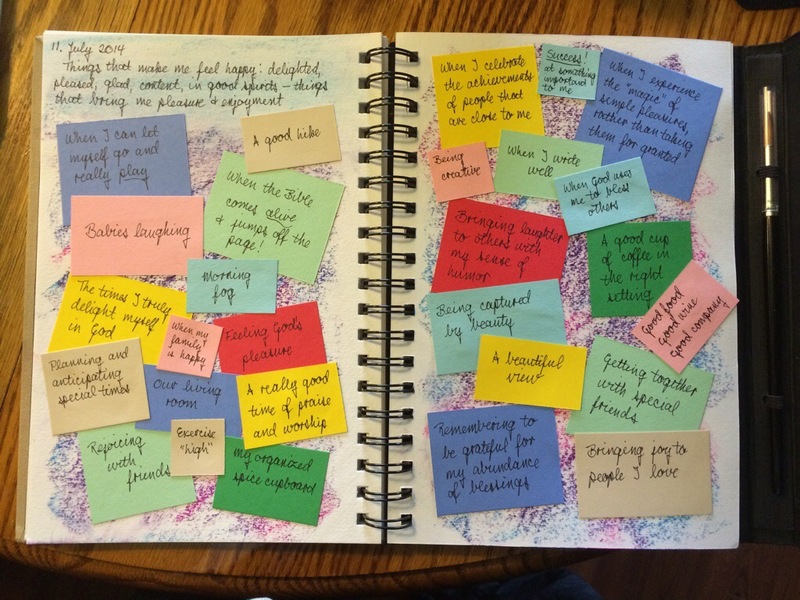 Today I spent some time thinking about what makes me feel happy. It’s not an exhausted list…and putting it together reminded me of a preschool “craft”…but it sure put me in good spirits! Then I thought, what about those times when I’m feeling down for no particular reason? I’m not talking about pasting on a smile when life is falling apart — that would be fake and ridiculous. But what about those days when I’m just feeling blah and out of sorts? Sometimes I need a “dose of happy”…a reminder of the beauty and goodness of life…a reminder that I have many reasons to smile. 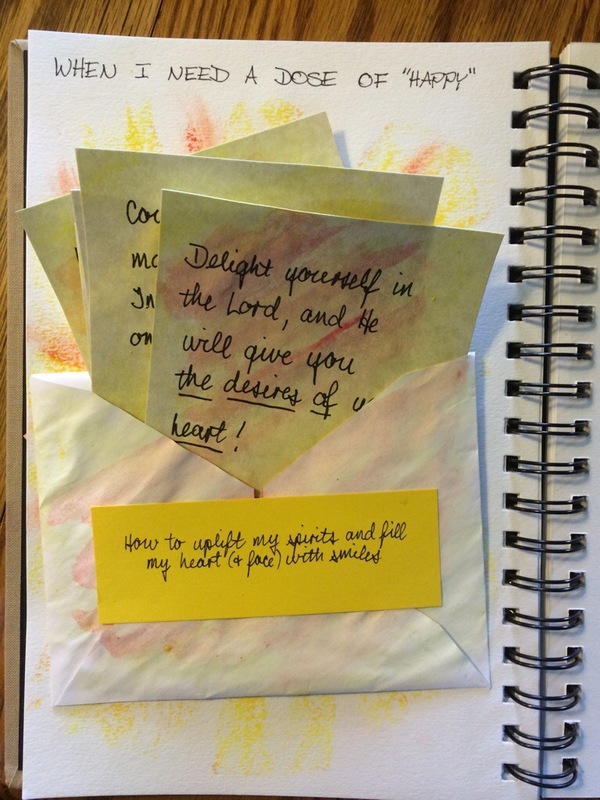 This entry was posted in This and That and tagged Faith, Gratitude, Journaling by rrprewett. Bookmark the permalink.